Please refer to the TelVue Connect instructions to upload content and add metadata. See instructions here on Creating a Playlist in Connect. 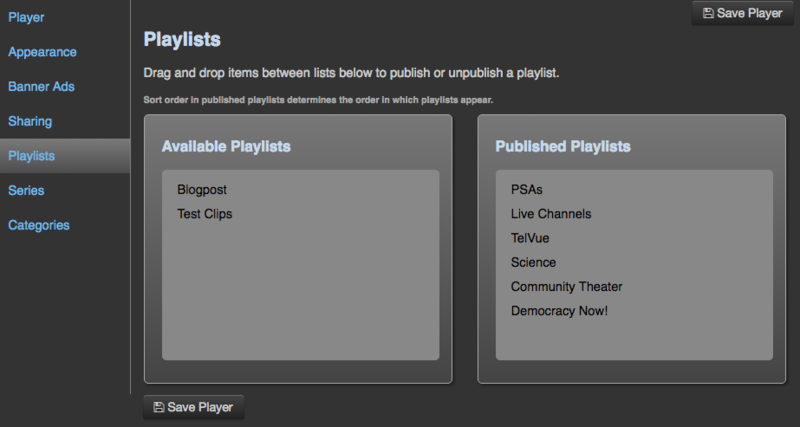 Once created, the Playlist will show up in the Available Playlists window. See instructions here on Creating a Series in Connect. Once created, the Series will show up in the Available Series window. See instructions here on Managing Categories in Connect. Is there anything in your playlist or series? If you create a playlist or series but don’t add any items to it, it will not display in your CloudCast player until videos are added to the collection. Is your video transcoded to VOD? If an organization, for example, has set auto-transcode to broadcast format only, then the user will need to specifically transcode any videos destined for VOD. Check the icons on the video thumbnail. If the eye is red, the video is not yet transcoded to VOD format. To transcode, select the Transcode option from the video edit menu, and then check the VOD option in the popup to initiate the transcode process. When the transcode is complete, the eye color will change to green and the video can be published to CloudCast.